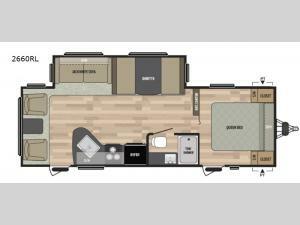 This rear living Springdale SS 2660RL by Keystone features a large slide out for added interior space, a dinette, and dual entry. There is sleeping for up to six individuals. There is a queen bed in the front bedroom, the u-shaped dinette can fold down into a bed if needed, and the jackknife sofa can fold down into a bed as well. There is also plenty of storage space with the pass through storage outside, and the overhead cabinetry and cupboards inside. So you can bring whatever you need with you to make your next camping trip enjoyable!